For whatever reason, the No. 7 Trojans put up a lackluster effort in their final game of the season against No. 10 BYU. USC struggled defensively in giving up five goals and an empty netter. Seniors Chris Dralla and Matt Carter-Tracy both scored in their final game in cardinal and gold. 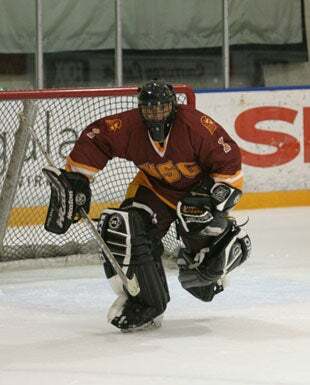 A University of Southern California hockey goalie put on a show, but it had nothing to do with stopping shots. Mickey Meyer rode his stick like a horse, dropped his bulky pants, mooned the crowd and slapped his buttocks during a game against Brigham Young University, police said. He was ejected and ticketed for lewdness, a misdemeanor, after an officer who was working security at the rink said he witnessed the scene Saturday. "I had my fill of these refs," Meyer said on an Internet broadcast of the game, according to The Herald-Journal of Logan. Of course, Meyer is also the goalie who stopped a puck with his head in a 5-3 win over UCLA on Jan. 19. The Trojans play in the Pac-8 Conference, which they won this year, and from what we understand each player is required to put up more than $1,000 of his own money to participate. So we think Mickey earned his little moment. This is him, front row, second from the right, we presume. We're still kind of surprised, though, that the incident didn't involve USC's backup goalie, Matt Buttweiler. (And here's a link to an MP3 play-by-play of the whole thing).